Take exit 22 in Connecticut - Round Hill Road. Continue straight through the stop sign at the end of the ramp. At the traffic light, take a left onto North Benson Road (Rt. 135) and continue straight for 0.8 miles (through two traffic lights.) The sign for the main entrance to Fairfield University will be on the left. Take exit 22 in Connecticut - North Benson Road. Turn right at the end of the ramp onto North Benson Rd. (Rt. 135). Go straight for 0.8 miles (through two traffic lights). The main entrance to Fairfield University will be on the left. Take I-91 South to I-95 South in New Haven. Take exit 22 in Connecticut - North Benson Road. Turn right at the end of the ramp onto North Benson Rd. (Rte. 135). Go straight for 0.8 miles (through two traffic lights). 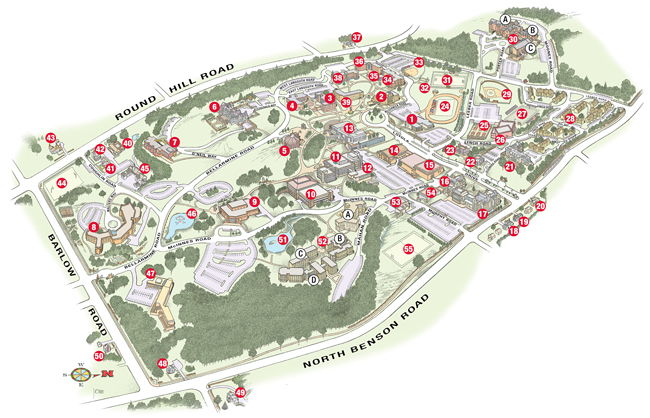 The main entrance to Fairfield University will be on the left. Take exit 44. Turn left off the ramp, and turn right onto Black Rock Tpke. (Rt. 58) at the light. Proceed 2 miles to Stillson Rd. (Rt. 135) and turn right. Bear left, at the second light, onto North Benson Road. The University entrance will be on your right. Take exit 44, take a quick left off the ramp, then take another quick left onto Black Rock Tpke. (Rt. 58), proceed 2 miles to Stillson Rd. (Rt. 135) and turn right. Bear left, at the second light, onto North Benson Road. The University entrance will be on your right. Take the Mass Pike (Route 90) West to I-84 West (exit 9). Merge onto I-91 South. I-91 merges into I-95 South in New Haven. Take exit 22 - North Benson Road. Turn right at the end of the ramp onto North Benson Rd. (Rt. 135). Go straight for 0.8 miles (through two traffic lights). The main entrance to Fairfield University will be on the left. Library visitors may park in the Kelley lot without a permit. Visitors who wish to park closer to the library may park in the K3 lot between the School of Nursing and Alumni Hall after obtaining a temporary pass from either the Department of Public Safety in Loyola Hall or from the Library's Circulation Supervisor and displaying the pass in the vehicle.